ISBN 9790006539284. 30 x 23 cm inches. Text Language: English. Illustrations: Charlotte Panowsky. After beginning with open strings and simple note values, learners become acquainted with the 'cuckoo call' (minor 3rd) as a basic interval for guidance purposes and for mastering good intonation. Volume 1 makes use of nursery rhymes, all of which are supplied with words to ensure that the melody lines can be easily grasped as a whole. All the fingers are introduced in succession, as well as simple accidentals and note values from whole note (semibreve) to eighth note (quaver). From the very beginning the volume places a special emphasis on reading musical notation and offers training in moving from one string to another and basic bowing strokes. Large print and delightful colour illustrations make the volume especially appealing to children. Enclosed is a sheet of cut-out musical cards that allow young learners to invent many puzzle and guessing games and later to master scales and pitch names. To accompany this volume we recommendSpielbuch fur Streicher('Recital Pieces for String Ensemble', BA 9698) andWeihnachtsspielbuch('Christmas Pieces for String Ensemble', BA 9699), both edited by Egon Sassmannshaus. They give even the youngest learners an opportunity to try their hand at string ensemble playing. 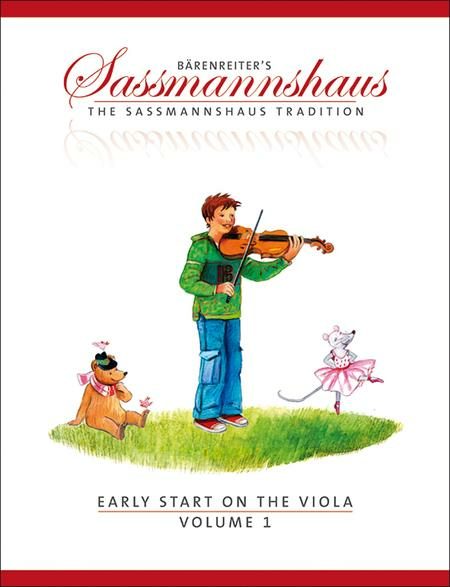 In 1976 Egon Sassmannshaus, one of the most experienced and renowned violin teachers in Germany, published his tutorFruher Anfang auf der Bratsche. This standard work for young string players quickly became the most popular and best-selling tutor in the German-speaking countries for beginners on the viola. His son Kurt Sassmannshaus functioned as co-editor of the English-language edition,Early Start on the Viola(BA 9686, BA 9687, BA 9688, BA 9689), adapting his father's successful tutor to meet the needs and requirements of English-speaking children. The combined knowledge and experience of both father and son make these four volumes the most thoroughly researched and thought-through viola tutor for beginners all over the world.